Titanium Welded Tubes Suppliers and Exporters, Titanium Seamless Tubes, ASTM B338 Titanium Alloy Tubing, Titanium Alloy Tubes in Mumbai, India. 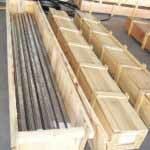 Dealer of ASTM B338 Titanium Tube, Titanium NCF Tubes, Ti. Alloy ERW Tubes Supplier, Titanium Tubing, Titanium Tubing, Titanium Alloy Tubing Manufacturer in India. Ganpat Industrial Corporation is a known manufacturer and exporter of Titanium Tubes, which is the softest titanium and has the highest ductility. Applications of Titanium Seamless Tubes include: Airframe components, cryogenic vessels, heat exchangers, CPI equipment, condenser tubing, and pickling baskets. The high strength, low weight ratio and outstanding corrosion resistance inherent to this Titanium Welded Tubes and its related alloys have led to a wide and diversified range of successful applications. Of the four commercially pure (C.P.) titanium grades, Titanium EFW Tubes is typically used in applications that require superior corrosion resistance in various aggressive media. 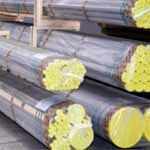 Titanium Round Tubes are metals that contain a mixture of titanium and other chemical elements. Commercially Pure Titanium Rectangular Tubes is one of the most common of unalloyed Titanium. These Titanium Electropolish Tubes provide low weight, good mechanical features, thermal properties and corrosion resistance. Pure Titanium Hexagonal Tubes undergoes an allotropic transformation from the hexagonal close – packed alpha phase to the body – centered cubic beta phase at a temperature of 882.5 Degree C (1620.5 Degree F). Titanium Alloy Tubing, Titanium Tube, ASTM B338 Titanium Welded Tubing, Titanium Alloy Seamless Tubing, Stockholder of ASTM B338 Titanium Tube, Titanium Tubing Manufacturer, Titanium Welded Tubes Stockist in India. Depending on the size of the diameter of the tubes these individually (large diameter Titanium Tubing) or in bundles (small diameter Titanium Tubing) are transported. Titanium Tubing in bunches are taken together with metal strips or wires in the transverse direction. It is important to make sure that the strapping is very firm, so that the individual tubes can not move against each other and thereby suffer damage. Subject to transport, duration and turnover can be wrapped in eg plastic jute fabric and is provided at the bundle ends and stop points with sheet metal bundled tubes. specialty tubes shall be protected against corrosion and are usually coated or in appropriately chosen cases or wood-corrugated structures packaged. titanium tube suppliers,titanium tubes price, titanium tubing, titanium tubing for sale,titanium tubing price,titanium tubing, titanium properties, alloy tubes, nickel alloy tubes, titanium alloy tubing, seamless nickel tubing, titanium equivalent alloy, titanium tubing.